Our bedrooms are tastefully furnished in muted colours and premium fabrics and every effort has been made to ensure guests enjoy a good night's sleep. We offer two bright bedrooms for guests, one double room (shown left) and one twin room (shown below). Both bedrooms have ensuite facilities which are equipped with the usual toiletries you expect to find in a 4 star bed and breakfast. 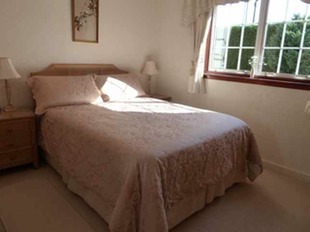 The double bedroom overlooks the beech hedge and the furnishings are all solid ash. I tend to refer to this room as the Ash Room and the twin room, with oak furniture, I call the Oak Room in the online booking system. The twin room overlooks the garden. Both ensuites are equipped with power showers. Each room is equipped with a hairdryer and radio/alarm clock is provided along with other thoughtful extras, including extra pillows. Ample power sockets are provided. There are our own-designed information folders in each room which provide detaile information about the area and include a list of local places to eat with my personal comments thrown in! The hospitality trolley in the front lounge gives a wide choice of teas and coffee (both fully-leaded and decaffeinated).. Fresh and powdered milk are always available along with a selection of biscuits. Should a guest wish iced water they only have to ask. I do not provide bottled water as the tap water here is perhaps the best drinking water in Britain. All water in the cold taps comes straight from the mains supply and is therefore is perfect drinking water. The house has full central heating with easy-to-use individual controls on each radiator. Windows are double-glazed to ensure the house is kept at a comfortable temperature all year round and there is the addition of a coal/gas fire in the front lounge which is fine for cooler evenings. Additional heating in the sitooterie in colder months is by a power radiator. All rooms are non-smoking. Please note we are closed from 1 October to February and reopen 1 March each year. The rates stay the same throughout the year and do not fluctuate with the seasons. Certain weekends in the year there may be a minimum stay of 2 nights. One example is the first weekend in September each year when the world renowned Braemar Games takes place. Double: £35 per person, per night with two people sharing. 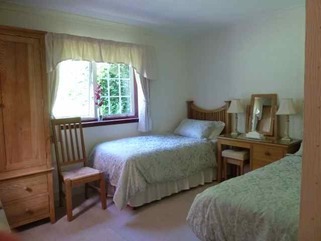 Twin: £37.50 per person, per night with 2 people sharing. For a stay of three nights or more (if booked directly with us) the price will be £32.50 (double) / £35 (twin) per person per night. Occasionally I can offer one of the rooms for single occupancy at £45 - £50 per night. All rates include a full breakfast. As much as possible the breakfast produce is sourced locally. The usual check-in time is between 4.30pm and 7.00pm. If guests wish to arrive outside these times please let me know and I can ensure I am here to greet them. I cannot guarantee having rooms ready before 2.00pm. I ask guests to vacate their rooms by 10.00am on their day of departure. If you need to cancel your booking up to 3 days prior to your arrival, please telephone or email me immediately. If the cancellation is less than 3 days from the date of arrival I reserve the right to invoice you for 50% of your booking if I am unable to relet the room(s) you booked. In the case of a 'no show' the full price will be invoiced to you.